Hearing aid battery club members receive special discounts on hearing aid batteries. The Battery Club is a convenient way to make sure you always have hearing aid batteries when you need them. Bluetooth-enabled hearing aids can be wirelessly connected to devices such as televisions, cell phones, FM systems, GPS systems, and PDAs, with the use of Bluetooth technology. Bluetooth technology works similarly to wireless Internet, where sounds are sent through an invisible electronic signal. Mapping is the term used for programming a cochlear implant. Cochlear implant maps are set based on an individual’s response to sound through the cochlear implant device. Professional staff is available to help you with problems you may be having with your hearing aids. They can also spend time with you and discuss ways to make listening with hearing aids easier in your day-to-day life. Family members are welcome and encouraged to come with you and learn about your hearing aids. Once your hearing aids have been fitted to your complete satisfaction, we will provide you with detailed information on how they should be maintained. Of course, you can have your hearing aids checked by us at any time. This will ensure that the sound quality remains as good as ever, and will extend the life of your aids. Workers in certain occupations are required to receive regular hearing tests due to the risk of hearing loss that can be caused by excessive noise in their workplace. These hearing screenings can be completed in less than 30 minutes, and comply with the standards set by OSHA. 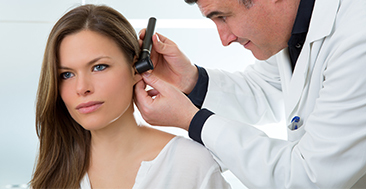 Real Ear Measurement (REM) is a fitting process that uses probe microphones and live real-time speech to allow the patient and their family members to immediately see and understand the benefits of hearing aids and fitting adjustments. In order to adjust your hearing aid to your individual requirements, we first determine your personal hearing profile, or "audiogram." This is done by testing your ability to hear a variety of speech and environmental sounds.